The Lifer's Club is a group of 243 men at the Bledsoe County Correctional Complex in Pikeville, Tennessee. Throughout the year, they lead fundraising drives to raise money for nonprofits. In the last three years, they’ve raised more than $56,000 for a dozen organizations. PIKEVILLE, Tenn. — Blue skies and barbed wire fencing, it’s a vivid contrast of choice and consequence at the Bledsoe County Correctional Complex in Pikeville, Tennessee. “When I came into prison, I broke my mom, my grandpa and my grandma’s heart,” Inmate #1 said. “I was 22 years old,” added Inmate #2. “I got into a fist fight with a friend of mine and he was fatally wounded. The identities of the two inmates can’t be revealed, but both say they grew up in loving homes. In fact, the father of Inmate #2 was a police chief. However, their choices landed them behind bars and now, both have a lot of time. “I’m currently serving a life sentence,” Inmate #2 said. Time to think and time to change. Ten miles away, children at the Van Buren Head Start in Spencer, Tennessee play with new toys, gifts from strangers. They’re oblivious to a harsh reality. It’s a need the Bread of Life Rescue Mission nourishes daily 45 minutes away in Crossville, Tennessee. Both Bread of Life Rescue Mission and the Van Buren Head Start depend on generous donors and that takes us back to the Bledsoe County Correctional Complex and Inmates #1 and #2. “We try to do a lot of things locally right here because this is a really poor area,” said Inmate #1. You see, not only have both inmates earned multiple degrees, even specialty licenses in prison, they lead a group of 243 inmates called the Lifer's Club. 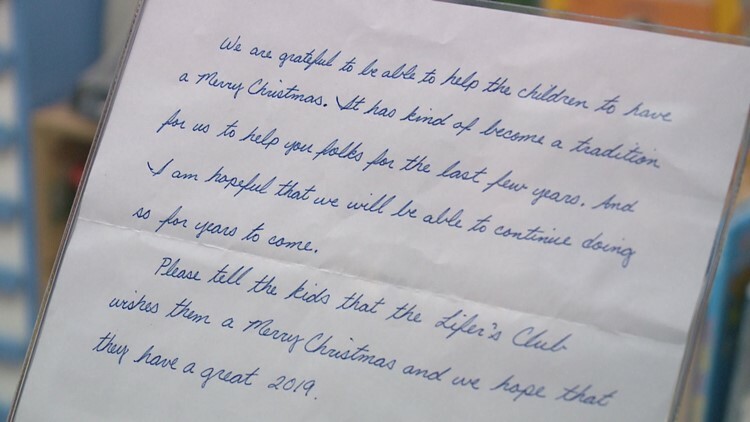 “The Lifer's club is a group of men here at the prison who’ve got 25 years or more currently and we’re all trying to give back,” said Inmate #1. In 2018, the Lifer's Club donated $3700 to buy stem toys at Van Buren Head Start. “The prison is one of our biggest contributors,” said Hillis. “It’s kind of a way for us to right a wrong that we did when we weren’t able to be there for our kids,” said Inmate #1. The Lifer's Club also donated more than $3,000 to the Bread of Life’s Christmas program. “We took care of over 120 families with gifts and food,” said Reagan, describing how the helped Bread of Life Rescue Mission. 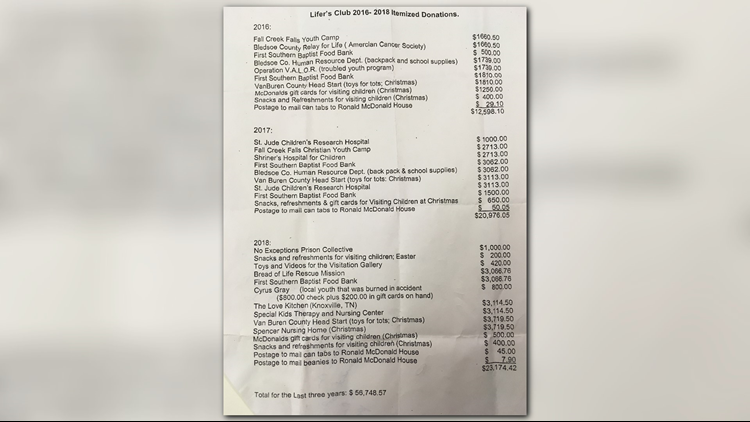 In 2018, the Lifer's Club raised more than $23,000. And, in the last 3 years, they raised more than $56,000 for Van Buren Head Start, Bread of Life Rescue Mission and a dozen other nonprofits in Tennessee. “What do you want people to know about you and the Lifer's Club,” asked 10News Anchor Beth Haynes. Ralph Reagan of Bread of Life Rescue Mission is proof. “I’ve been there,” said Reagan. In addition to creating the Bread of Life Ministry, Reagan has served as a volunteer chaplain at the Bledsoe County Correctional Complex for 37 years. Before that, he was actually an inmate there. “I had 7 felonies on me,” explained Reagan. Former Governor Bill Haslam fully pardoned him last July. “Just because you’re a felon doesn’t mean there’s not still something in the world left for you to do,” said Reagan. And, she says Christmas wouldn’t be the same without the Lifer's Club. “The children would be the ones that would lose,” said Hillis. It’s an impact that provides the inmates peace and moments of freedom from their past. Next year, the Lifer's Club hopes to donate $30,000 dollars to nonprofits.